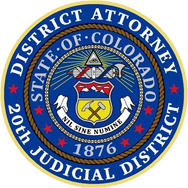 Honoring Crime Victims’ Rights – Please join Boulder District Attorney Michael Dougherty and the Victim/Witness Unit for our 33rd Annual Victim Advocacy Awards and Reception, Thursday, April 4, 2019 at 2:00 p.m. Location: Jury Assembly Room, 1st Floor, Boulder County Justice Center, 1777 6th Street. 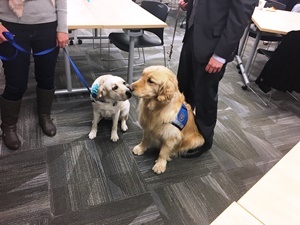 DA Dog Amigo and Marion, Blue Sky Bridge’s Therapy Dog, meet at the Sexual Assault Awareness Open House hosted by the District Attorney’s Office (April, 2017).